We prepared for rain when we visited Portland, Oregon because the average annual rainfall is 36 inches. Therefore we were not deterred from visiting the Portland Japanese Garden in February. We were on a American Camellia Society (ACS) tour. The median age of this group is seventy, with anyone mobile walking the gardens in intermittent light rain. 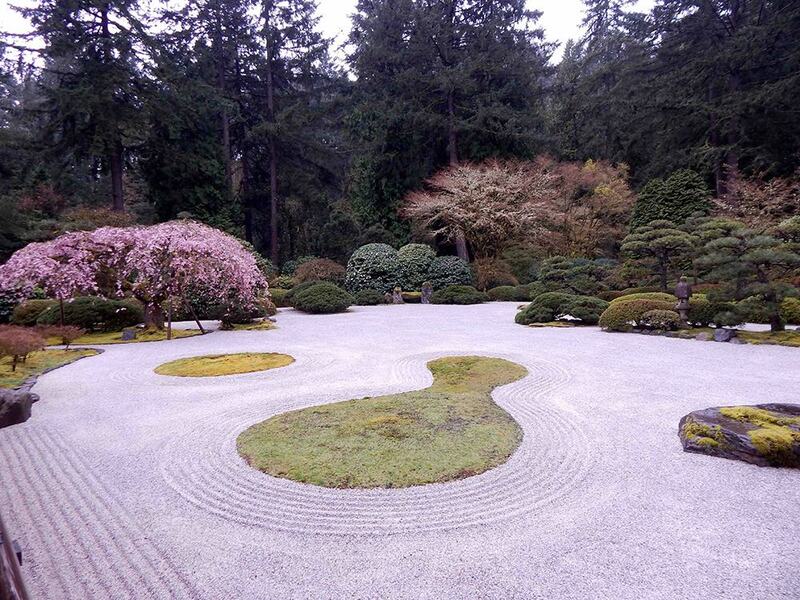 This Japanese garden covers twelve acres and has eight gardens and a Cultural Village. Visitors begin at the “Entry Garden” by hiking up a zigzagged terraced stone pathway with firs and cedars towering overhead. Those unable to walk up this hillside were transported by a free minivan to the culture center. The largest of these gardens is the “Strolling Pond Garden” with a stream that connects the upper and lower ponds. The stream flows under a Moon bridge so named because the arch structure is like a half moon. My favorite was the “Flat Garden” typical of a feudal lord’s garden with a large pavilion. The raked white sand symbolizes water with grassy mounds resembling islands, all of which is surrounded by maple trees, moss, evergreens, azaleas, and camellias. 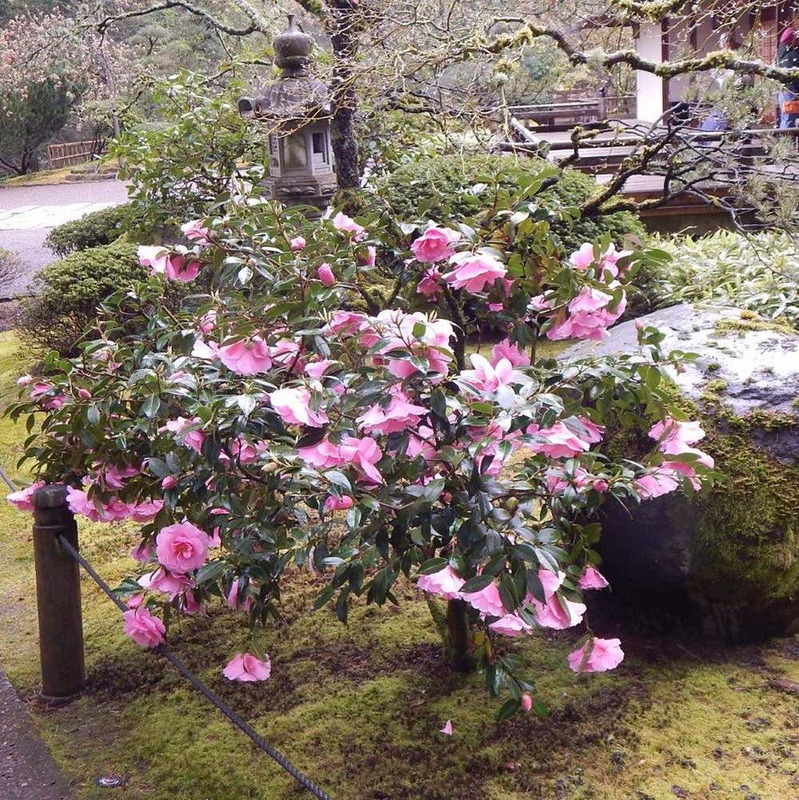 A beautiful orchid pink camellia was in bloom among firs and garden sculptures as we entered the pavilion. We recognized it as ‘Donation,’ a Williamsii hybrid introduced by Clarke from England in 1941. It is one of the best early crosses between two camellia species (C. saluenensis x C. japonica). It received its name because Mr. Williams who imported seeds from Asia donated some seed to his friend Mr. Clarke who grew this cultivar. The “Natural Garden” features ponds, waterfalls, and streams with trees, shrubs, ferns, and moss growing everywhere. The Japanese or red-crowned crane is revered in Japan. 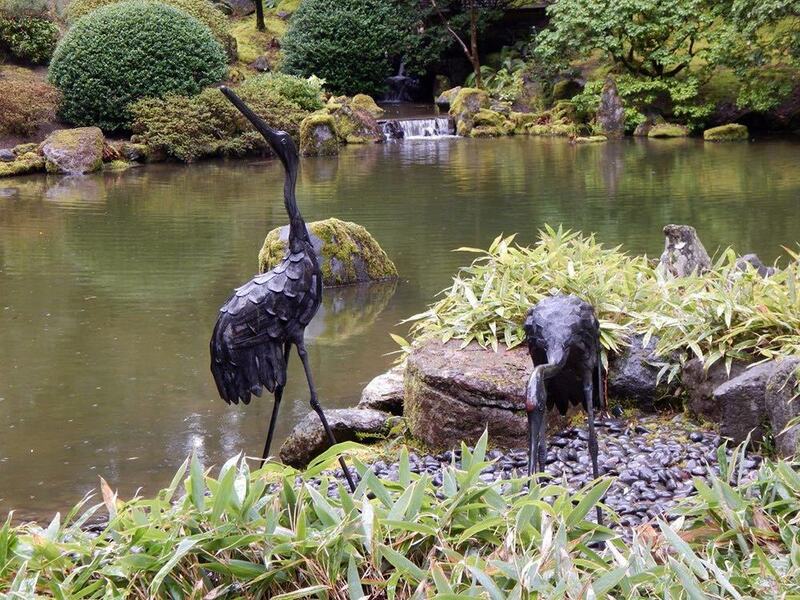 Therefore crane sculptures are found in many Japanese gardens symbolizing peace, luck, and longevity. In addition, as they typically mate for life, they represent fidelity. 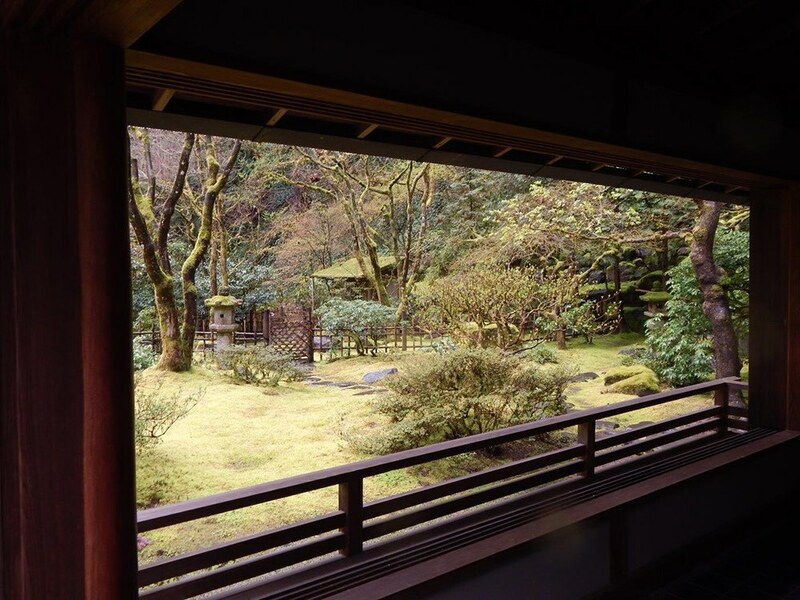 The "Tea Garden" has an authentic tea house constructed in Japan and two sections. An interesting view of the secluded back garden is seen through the tea house window. 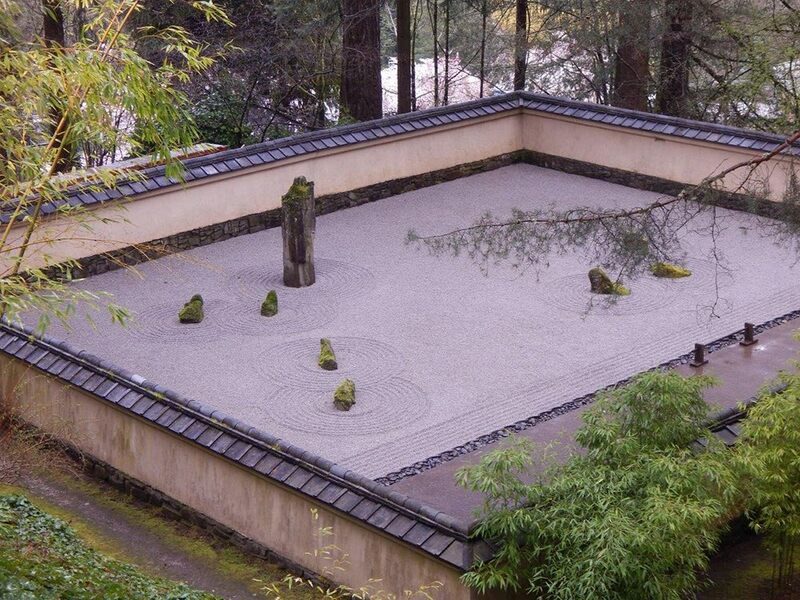 The "Sand and Stone Garden” is a Zen meditation garden which is viewed from pathways and decks that look down on the rippled sand suggestive of water punctuated with moss covered stones making small islands. This small garden was very pleasing. The islands reminded me of “viewing stones,” a traditional natural Japanese art form where people collect and name picturesque rocks to display. New gardens were added when the Cultural Center was expanded 2017. Bonsai are highlighted in the “Ellie M. Hill Bonsai Terrace” and modern Japanese garden style is the focus of the small garden “Tsubo-Niwa”. This authentic Japanese Garden is a beautiful and tranquil place. It is very well landscaped and maintained with many interesting photo opportunities. It profits from amble rainfall making it exceedingly green with moss growing everywhere. 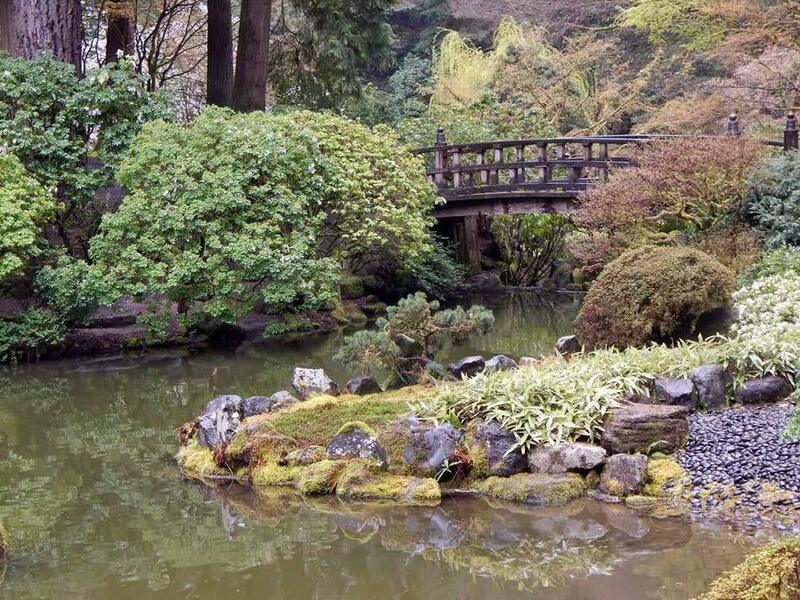 The garden is well worth visiting for local residents and a must for people interested in nature and Japanese culture able to visit Portland, Oregon. -Story contributed by Bradford K.